The actions and events in the novel are often referred to as the story. First this happens, and then that happens, and so on chronologically. But the author often decides to tell the story bit by bit, and not always in a chronological way. A novel may even start right at the end of the story. We call this the plot of a novel. When we discuss the plot we also look closely at why things happen, how one thing leads to another. Write a short summary of the plot in the last three chapters you read. If you finished the novel already, choose three chapters which do not spoil the outcome of the novel and the murder mystery. In the first three chapters of the book, we get to know that there is a dog names Wellington, who is found dead in the garden of Mrs. Shears, the owner of the dog. Christopher, is Mrs. Shear' neighbour, and he is the one who discovers Wellington first. Christopher makes it his job to solve the mystery of who killed Wellington. Since Christopher promised his father that he wasn't going to do any more detecting, he couldn't continue the book, and it didn't have an ending. The two following days, were black days. But one day he saw 5 red cars in a row, which ment a super good day. So that day, he was willing to take some risks, like talking to Mrs Alexander and join for walk in the park with her. He got to know why his father didn't like (hated) Mr. Shears. And Christopher introduced us to the Monty Hall Problem. Christopher has been talking about what he likes and dislikes about the third of the four crime novels by Sir Arthur Conan Doyle, featuring the detective Sherlock Holmes, which he also finds similar to himself. He also tries to explain to you parts of the book. He has also been talking to Siobhan about his own book, though she wanted to talk to him about his mother. He has also been explaining how his memory is like a film. Christopher met Mrs. Alexander once more time, and this time it was at the at the shop. Christopher was going to my some candy when he saw Mrs. Alexander, she first asked why Christopher just went away went away last time they met. Christopher answer that it was because Mrs. Alexander was a stranger. Then he went out and saw Mrs. Alexander's dog, and we all know that Christopher likes dog so he patted a bit with the dog until Mrs. Alexander came out of the store. Then they went to the park together and Mrs. Alexander told Christopher what Mr. Shears did with his mom, something that she not really should have said. Siobahn reads in Christopher's book that he has found out about his mother and Mr Shears, and seems rather concerned that Christopher is more affected by it than he cares to admit. However, he manages to convince her, and me, otherwise. He goes on to tell us about his memory, and how it works like a film. It can be fast-forwarded or rewinded, and the dates work as his clock. The same day, when he gets home from school, he watches a science film and by mistake leaves the book on the kitchen table. His father gets furious when he finds it, and confronts Christopher. They have a physical fight, and Mr. Goone hits Christopher so hard he blacks out. When he regains consiousness his father stands simply staring at him for about a minute, before going to get a drink. In the past three chapters Christopher has been trying to go to London, where his mom lives. He knew that he should take the train to London, but he did not know where the train station was. He asked a lady with a kid where he could buy a map, only to be told that he did not need a map because the station was insight. However, Christopher manages to find a crowd where he loses concentration, and therefore becomes lost. He wanders around until he uses a strategy where he only turns right until he arrives at a street where he has been before, and then turns one left. He finally arrives at the station, but is distracted by all the people. He sits down until a police officer approaches him. The police officer tells him how to buy a ticket to London. On the train the police officer grabs Christopher, because his father is at the police station looking for him. The train leaves the station before they get off. Christopher uses the bathroom, and then climbs onto a shelf, where the police officer can't see him and therefore assumes he is gone. 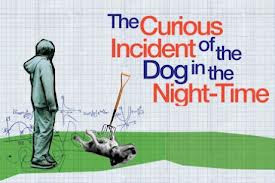 The narrator describes how, at seven minutes after midnight, he sees a dog 'lying on the grass in the middle of the lawn in front of Mrs Shears' house.' He sees that it is lying on its side, and that it has a garden fork sticking out of it. He wonders who could have killed it. The narrator introduces himself as Christopher John Francis Boone. He says he knows 'all the countries in the world and their capital cities and every prime number up to 7507.’ He describes how, when he met Siobhan eight years ago, she showed him a picture of a sad face. He describes how he understood the picture to mean sad and so told her to draw several faces so that when people spoke to him and he couldn't detect their mood, he could refer to his drawings for help. Siobhan laughs at him, and draws a picture of a puzzled face, telling him that he would make people feel weird if he did that. So he stops and says that if he doesn't know how to read people's moods in the future, he will simply ask them or walk away. In this book we meet Christopher, a 15 year old boy with the Asperger Syndrome. We get to know his thoughts and opinions while he is searching for the killer of the neighbor's dog and at the same time as he has to deal with some personal challenges. Christopher arrives at the police station, and throughout the chapter we get insights in his thoughts, among other things about how the best way of escaping would of be (this was only a thought). He also talks about metaphors, and how confusing they are. Christopher takes everything literally, and therefor he doesn't understand metaphors, which describes something by using a word that it isn't. We've also introduced to Christopher's interest for prime numbers, and how to easily work out what prime numbers are. The plot in the three last chapters I read: Christopher and his mother have travelled back to Swindon where his father lived because Christopher’s mother didn’t want to live with Mr Shears anymore. Mr Shears didn’t accept that Christopher could live with them, so Christopher’s mother drove away from London. Then they come to Swindon Christopher’s mother had a key and they got in to Christopher’s father house. Christopher didn’t want to talk with his father because he is afraid of him after he killed the dog Wellington. Christopher takes his A level maths and he get an A grade. His father is tried to work out with him so he bought Christopher a dog because Christopher’s old rat Toby died, and he wanted to show that he never would kill a dog again. Christopher named the dog Sandy and Christopher becomes friend with his father again. Both Christopher, his mother and his father moved back to Swindon, because his mother had left Mr. Shears since he didn't want Christopher to stay with them. Christopher is still quite angry with his father due to the fact that he had killed Wellington and lied about his mother's death. Therefore he has to stay with his mother at her new place in Swindon, while his father is trying to gain Christopher's trust again. Christopher's pet rat, Toby, had died, so his father bought him a Golden Retriever to show Christopher how sorry he really is about what happened between them. Finally, things seems to be going back to normal, and Christopher manages to get his A math exam.